Jamaica is a democratic country but one beset with many problems. This chapter describes and explains the country’s governance, its divisions, and the problems it faces in serving its people. 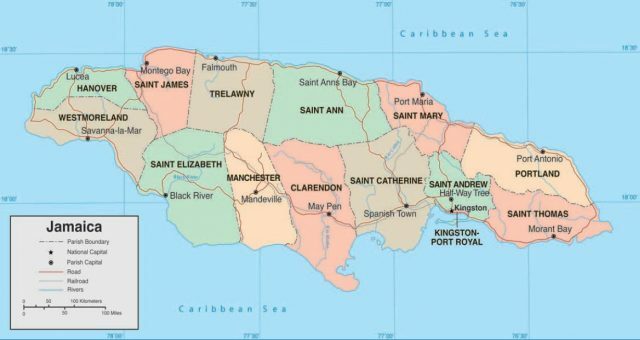 Cornwall, 1,565 square miles (4,053 square kilometers), the western county, which contains St. Elizabeth (capital: Black River), Trelawny (capital: Falmouth), St. James (capital: Montego Bay), Hanover (capital: Lucea), and Westmoreland (capital: Savanna-la-Mar). Politically, Jamaica suffers from the same problems that do many less developed countries (LDCs). Considering its diverse populations, poverty, differences in political ideology, and many other problems, the country can take considerable pride in the fact that it has been able to maintain a relatively stable government. Jamaica became an independent country on August 6, 1962. It is also member of the British Commonwealth. The government is a constitutional monarchy, with the British crown represented on the island by a governor general. The governor general appoints the prime minister who, in turn, recommends ministers who make up the cabinet. The prime minister and ministers come from the political party that holds the majority in the country’s parliament. Elections are held every five years. There are two houses of Parliament. The House of Representatives (60 seats) consists of elected representatives who serve five-year terms. The Senate (21 seats) is appointed by the prime minister and the leader of the opposition. The government is headed by the prime minister, who is required to consult with the governor general and the leader of the opposition on certain matters. Jamaica has three major political parties. They are the Jamaican Labour Party (JLP), the People’s National Party (PNP), and the more recently formed National Democratic Movement (NDM). The popularity of the Workers Party of Jamaica, a small Communist party, formerly led by university professor Trevor Munroe, is fading. The JLP generally favors private enterprise, whereas the PNP advocates moderate socialism. The PNP is the current ruling party, with 35 seats in the House of Representatives (after the 2002 election). Percival James Patterson, leader of the PNP, has been prime minister since 1992. William Alexander Bustamante, a businessman and labor leader, formed the Jamaica Labour Party in 1943. The JLP was elected to govern in the first election held under the 1944 constitution, which granted universal adult suffrage. Subsequently, the party was elected to office in 1949 to 1955, 1962 to 1972, and 1980 to 1989. The party’s current leader is Edward Seaga. The JLP is considered to be Jamaica’s more conservative and consistent party. For example, it has always promoted the free market system and during the 1970s and 1980s, it was strongly pro-U.S. and vehemently anti-Communist. The People’s National Party (PNP) was formed in 1938. Norman Washington Manley, an attorney, became its first leader soon afterward. Manley, who died in 1969, is now regarded as a national hero. The PNP formed the government from 1955 to 1962, 1972 to 1980, and 1989 to 1992. Under the leadership of Michael Manley (son of Norman Manley), the party promoted “democratic socialism” and aligned Jamaica closely with Cuba’s Fidel Castro. The current party leader, attorney Percival J. Patterson, is a strong supporter of the free market system. The trade union movement has grown rapidly. In 1996, there were more than 85 registered trade unions. The main function of the trade union is to act as mediator between employer and employee. The Trade Union Act of 1919 made it possible to form, register, and operate trade unions in Jamaica. It was not until 1938, a time of high unemployment, low wages, and widespread riots, that the first lasting trade unions were formed. They were closely linked with political parties. Alexander Bustamante organized the first union, the Bustamante Industrial Trade Union (BITU), in 1939. This union became affiliated with the JLP. The president of the BITU, former Prime Minister Hugh Shearer, only recently resigned as deputy leader of the Jamaica Labor Party. The Trade Union Congress formed in 1949, followed by the National Workers Union; both were linked to the PNP. The National Workers Union was founded out of a split between the PNP and the Trade Union Congress (TUC) in 1952. The two dominant trade unions are the BITU and NWU. BITU was formed out of five labor unions, with Bustamante the head of each. The unions represented maritime workers, transport labor, factory workers, municipal employees, and general labor. A few months after the formation of the five unions, Bustamante gave up the idea of a group of unions because of organizational difficulties and instead merged them into a single all-inclusive labor organization named after himself and designating him as president for life. The NWU started its activities in labor representation by organizing and eventually controlling the bauxite industry. It began with Noel Nethersole as president and Florizel Glasspole as general secretary. Michael Manley, the son of Norman Manley, was one of their assistants. Since then, other unions that are not connected to political parties have been formed. The first of these was the University and Allied Workers Union (UAWU) established by Trevor Munroe. Jamaica’s education system is based on the British system. Primary education covers six years from age six to age twelve (grades 1 to 6). It is free and compulsory (mandatory).At the end of this cycle, pupils sit for the National Assessment Programme (NAP), which is the basis of selection for secondary education. Secondary education covers five years (grades 7 to 11) with an additional two years (grades 12 and 13) for those who wish to proceed to higher education. Secondary education is available through a system of public and private schools. Government-sponsored scholarships for public secondary schools are awarded on the basis of a student’s success in the National Assessment Programme (NAP) exams. Children not admitted into government-aided secondary schools can obtain a secondary education at one of several private schools. Unfortunately, in terms of the country’s potential human resources, approximately onethird of Jamaica’s young people do not go on to secondary education. High schools are quite selective. They provide a maximum seven-year program leading to the Caribbean Examinations Council Secondary Education Certificate after five years (grade 11) and GCE Advanced “A” levels after another two years (grade 13). New secondary schools provide a five-year course. After four years, pupils may take the Jamaica School Certificate (grade 10), and the course usually leads to receipt of a Secondary School Certificate (grade 11). School generally starts early in the morning between 7:30 and 8:00 and runs until about 2:00 in the afternoon. Sessions are broken with both a morning and lunch break. Some schools operate on a shift system, with an additional set of students arriving in the afternoon. Students wear uniforms to school, whether in grade 1, technical school, or college. Boys are always in white or khaki shirts and khaki pants. Girls are usually in white shirts, but each school chooses its own color and style of dress or tunic. The streets literally become a rainbow of colors as students make their way to and from school. Mid-term breaks are of one to two weeks around National Heroes Day (the third Monday in October), Ash Wednesday, and Easter (Good Friday/Easter Monday). Schools set their own term dates, but they differ only slightly. Teams of teachers, education officers, and Jamaican and international consultants develop the curriculum in response to national goals and student needs. The primary school curriculum covers language, mathematics, science, social studies, drama, music, visual arts, physical education, and religious education. At secondary level public schools, the curriculum is centered around five core subjects: language arts, mathematics, resources and technology, science, and social studies. Jamaica is home to the main campus of the University of the West Indies (UWI), a regional institution with campuses also in Jamaica, Barbados, and Trinidad. The Mona campus is located in a Kingston suburb and is the site of the university’s central administration. The University of Technology, Jamaica (UTech), formerly the College of Arts, Science, and Technology (CAST), is Jamaica’s only national university. It is also located in Kingston. UTech was given university status in September 1995. Agricultural studies, science, and education are taught at the College of Agriculture, Science, and Education (CASE), located on the northeast side of the island in Portland parish. The college has its roots in the Government Farm School in Kingston, which first opened its doors in 1910. At its inception, the school’s goal was to train the approximately 12 young men enrolled at the time the “art and science of agriculture.” In its first decade, the school produced leaders such as the late Dr. T. P. Lecky, a Jamaican animal scientist who developed the Jamaica Hope and Jamaica Black breeds of cattle. For a developing country, Jamaicans generally enjoy good health. In 1966, the government began one of the world’s first national health services. Government clinics have provided preventative care and medical treatment ever since. Additionally, government-supported inoculation programs and investments to improve sanitation have reduced many diseases. For many years, government-operated public hospitals and clinics provided free Western-style medical care. Since the 1980s, however, government support of public health and social services has declined because of the island’s economic problems. A growing number of private hospitals and clinics now provide good health care, but at a cost. Today, health care is quite expensive and understaffed clinics and hospitals have long lists of patients waiting for treatment. Nearly all drugs must be imported and are very costly. Because the country’s medical care is so costly, many Jamaicans now rely on traditional remedies, going to a doctor only as a last resort. Jamaicans use fruits and vegetables for their healing properties. Papaya helps relieve indigestion, guava leaves treat diarrhea, and tamarind soothes itchy skin and chicken pox. Herbal medicines are popular. “Balmists” (rural “folk” doctors), who practice “bush medicine,” provide treatment for a wide range of ailments. Herbs, such as a tea, a poultice, or a bath, are administered. One popular folk remedy is bush tea, a concoction that contains ingredients such as lemon, fevergrass, soursop, breadfruit leaves, and pepper elder. Herbs, with colorful names such as search-mi-heart and shame o’ lady, are popular treatments for colds and stomach ailments. Ganja (marijuana) is boiled into a tea for asthma and eye complaints. The cerassee vine is used as a general health booster and is sold in teabags. This may sound primitive, but it is important to remember that nearly one-half of the pharmaceuticals marketed in the United States come from plant or animal extracts. Jamaica has two world-class international seaports: the Port of Kingston and Port of Montego Bay. Kingston’s transshipment port underwent expansion in 2001 to increase docking capacity for ships. The bauxite/alumina industry and agricultural exporters use smaller, specialized ports. Cruise ship facilities in Ocho Rios and Montego Bay were recently upgraded, and the government has announced plans to upgrade facilities at Port Antonio, including construction of a large yacht basin. If you were flying from the United States to Jamaica, you would probably enter the country through one of two international airports: Norman Manley International Airport in Kingston or Sangster International Airport in Montego Bay.Air connections from these airports to smaller airports located in Mandeville, Negril, Ocho Rios, and Port Antonio are available. 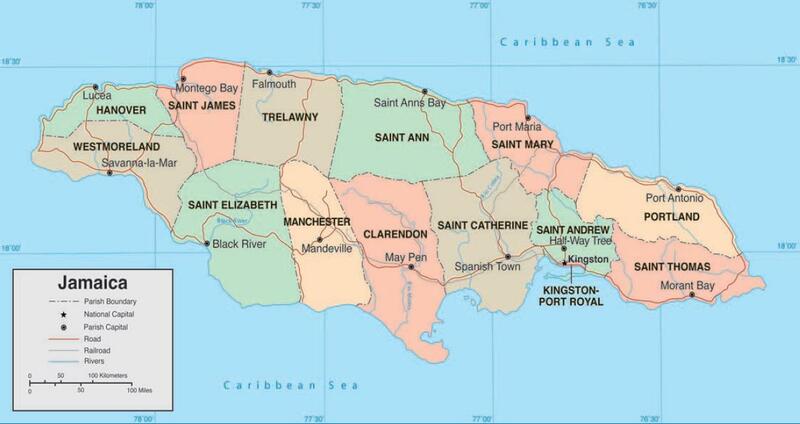 Roads crisscross the island and are major routes of travel for Jamaicans. The highway system, consisting of 10,000 miles of primary and secondary roads, is badly outdated and in disrepair. The author of this book once spent nearly six hours crossing the island on a 25-mile trip, which, should have taken no more than 30 minutes! The first phase of the North Coast highway project (linking the major coastal tourist areas of Montego Bay and Negril) began in 1999 but has not made much progress. Driving can be a very scary experience in Jamaica: The country uses the British system of vehicles with the driver in the right side driving on the left side of the road, and few drivers seem to obey the traffic laws. The roads are cluttered with animals, pedestrians, carts, abandoned vehicles, and potholes. The country has a very high fatality rate considering the miles driven.